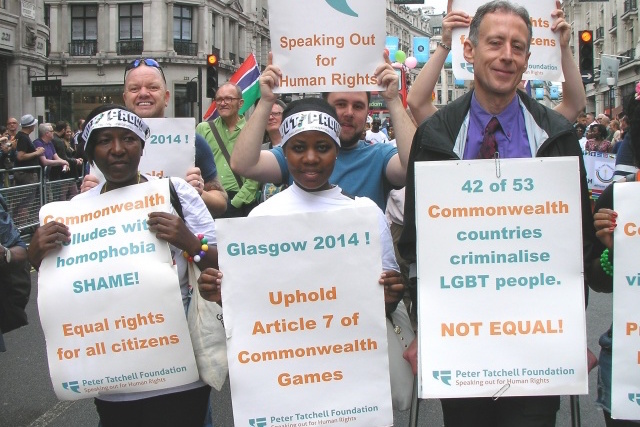 Peter Tatchell urges adherence to the Commonwealth Games’ Article 7. 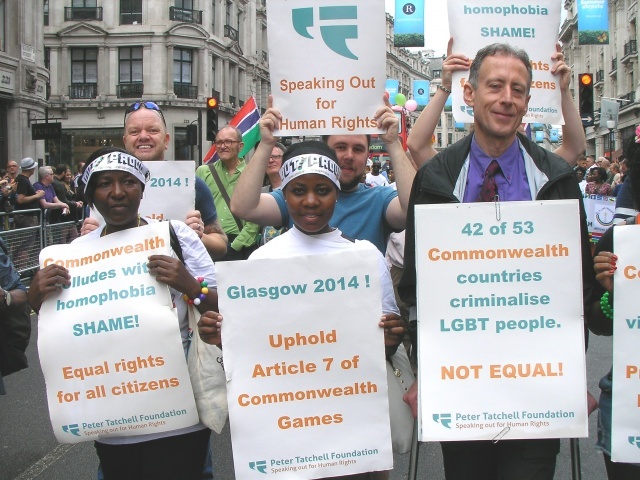 The Peter Tatchell Foundation is urging the organisers of Glasgow 2014 to require competing nations to sign a pledge of non-discrimination in their team selection in accordance with Article 7 of the constitution of the Commonwealth Games Federation. We are also suggesting that the pledge expand the grounds listed in Article 7 to include an explicit pledge of non-discrimination based on ethnicity, caste, sexual orientation and gender identity. This would be a very significant, high-impact equality initiative. It has never been done before at any Commonwealth Games and would make Glasgow 2014 unique, trailblazing and rightly deserving of public acclaim. While all participating countries agree to accept the Commonwealth Games constitution, which includes Article 7, this is a mere formality. They have never been specifically asked to agree to non-discrimination. Peter Tatchell (right) and campaigners march during Pride London 2014. Prejudice, discrimination and legal victimisation are prevalent in many Commonwealth countries. This may prevent affected athletes securing access to top class sports facilities and training camps – and inhibit their selection for their national team to the Commonwealth Games. In most Commonwealth countries, for example, the level of homophobia and transphobia is so great that it is very unlikely that a LGBT athlete would be selected for their national team. Glasgow 2014 should make it clear that all such discrimination is incompatible with Article 7 and participation in the Commonwealth Games. The organisers could, through this pledge, help foster a culture of equality, where athletes are more likely to be selected and compete solely on the basis of sporting merit. We hope Glasgow 2014 will accept our proposal to further enhance its existing commitment to equality. Written by Peter Tatchell on 14th July 2014. The Peter Tatchell Foundation (PTF) seeks to promote and protect the human rights of individuals, communities and nations in the UK and internationally in accordance with established national and international human rights law. The aims and objectives of the PTF are to raise awareness, understanding, protection and implementation of human rights in the UK and worldwide. This involves research, education, advice, casework, publicity, lobbying and campaigning for the enforcement and furtherance of humanitarian statutes and values.